Anti bullying graphic novel, Babymouse Queen of the World! Anti-bullying graphic novel, Babymouse Queen of the World! Babymouse burst onto the scene in 2005 in Babymouse Queen of the World. Since then, enthusiastic readers have flocked to the series of fifteen graphic novels for middle grade readers. Babymouse Queen of the World introduces a strong female character. Babymouse has a vivid imagination, she loves cupcakes, reading and scary movies. She longs for adventure, glamour and excitement and hopes for straight whiskers and no homework. 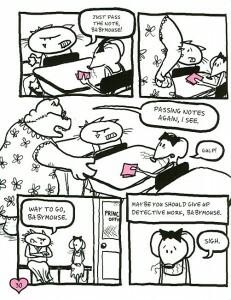 Instead, Babymouse is stuck with chores, tons of homework, a locker that sticks and some very annoying curly whiskers. When Babymouse hears about an upcoming slumber party to be hosted by Felicia Furrrypaws, she is willing to do almost anything to secure an invitation. When Felicia fails to complete a homework assignment, she acquires Babymouse’s book report in exchange for an invitation to the her party. Babymouse ditches her best friend, Wilson the Weasel, misses their scary movie night and goes to the slumber party. We’re out of popcorn. Go make yourself useful, Babymouse… And bring extra butter. Middle grade readers will be drawn to this boldly illustrated anti bullying graphic novel. They will connect with Babymouse’s dreams and identify with the frustrations and challenges she faces.